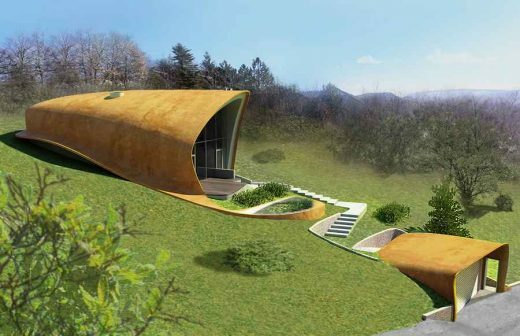 This curvaceous property design contains – next to the living area – four bedrooms, two bathrooms and the atelier. The internal spaces are arranged in the living area in a high ground-floor – above which is positioned the restaurateur atelier – the bedrooms and the service areas arranged on two levels, divided by generations. The plot is of 20 percent slope, therefore the external pathways are getting an accentuated role in the volumetric composition. The main built elements are the garage and storage at the entrance, the stairs of the pathway, the garden pond and the residential building. 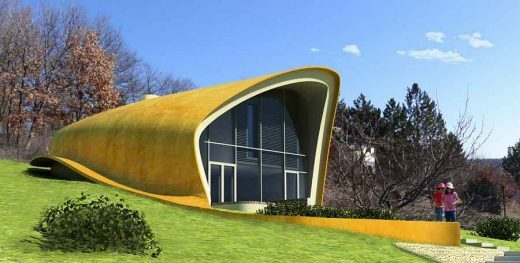 The external covering is coloured bare shotcrete, applied on the multiple layered shell of the „Free Form Buildings” cupola structure. The application of this construction system –next by the advantageous construction costs- is facilitating the energy consumption of the use. The cupola structure –in the internal cells- contains the insulation and compared with a flat plane design its curved surface is reducing the external surface of the build volume – the heat exchange between the external and internal spaces. The building design is corresponding to the passive house requirements. The heating is supplied by air to air heat recovery and ground heat exchanger ventilation. 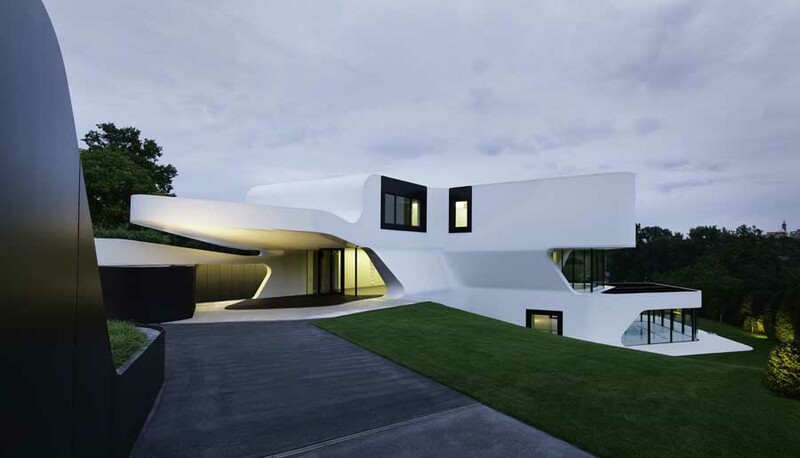 This project is the third application of the ‘Free Form Buildings’ construction system. Location: Hungary, Nagykovácsi, Vértes street 13. Description: The building is designed for a four member family.